Rangiora’s Dennis Bennett is trying his best to retire but BJ Lindenny is going to be keeping him busy for a while. The former smart juvenile trotter returned to the winner’s circle at Addington on Friday night after a year off the scene and is the only racehorse that Bennett has in work outside of a couple of two-year-olds including a brother to BJ Lindenny. “We race BJ Lindenny with an elderly couple in John and Betty Ashby and they’re quite keen to enjoy pottering around racing them,” said Bennett. Bennett has had to take things very easily since a serious training accident in October which put him in hospital with numerous broken bones and a brain bleed. “A horse went over the top of me and it was while they were picking me up off the track and putting me in the ambulance that Linda (wife Joyce) mentioned that maybe someone was trying to tell me something and it was time to give it up. BJ Lindenny was mixing it with the likes of Majestic Man, Castlereagh and Sundees Son as a juvenile and made the Jewels at Ashburton. 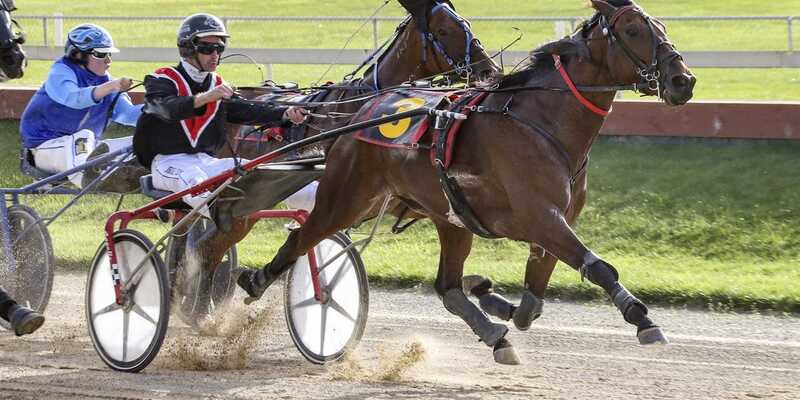 He returned as a three-year-old to win a maiden race at Oamaru in February last year and then started in the Hambletonian, but a few weeks later Bennett knew something was wrong when BJ Lindenny dropped right out in a Sires Stakes Prelude at Addington. “It turned out he had a bad virus so we had to tip him out for the season just when he had all the good races coming up. “Then when I was bringing him back over the winter, I think he must have kicked a post as he hurt a hind leg. After being away from the track for so long, BJ Lindenny took a couple of races to regain race fitness, but he was back to his best on Friday night and comfortably led from start to finish for Robbie Close to hold out the favourite Lone Star Lad. He was helped at the start when the two horses drawn inside him went missing, one scratched and the other a breaker, while Lone Star Lad also trotted roughly towards the finish and Sam Ottley had to take hold of him. “I’d figured the race a week earlier where they went a sharp mobile 2600m (in 3.20) had cleaned him up quite nicely. “He’d come to the end of his run about 100m out, but I think he also got bogged down in the passing lane. “The shingle tends to gravitate down there and I’ve noticed quite a few horses making no progress in the passing lane lately. “And I noticed that Robbie took him a little wider on the track when he won. “He’s no superstar so we’ll just look to place him as best we can from here. Bennett was breeding commercially on quite a big scale not so long ago but is down to just the four broodmares these days. He had a couple of good yearling sales this year with a Bettor’s Delight colt from Lady Dancer going for $55,000 and a Love You half-sister to Show Gait selling for $42,000, while the brother to BJ Lindenny was passed in. “He is a rather big colt and already 16 hands and the Ashbys wanted a bit more for him. “He’s just been gelded and once over that we’ll break him in. Bennett bred their dam – the Sundon mare Annabelle Lindenny – and sold her as a yearling to the Ashbys, for whom she won three races. They then asked to race her foals together and BJ Lindenny is the first one. The fact that Bennett, 67, opted to sell a Love You half-sister to Show Gait as a yearling pretty much sums things up.